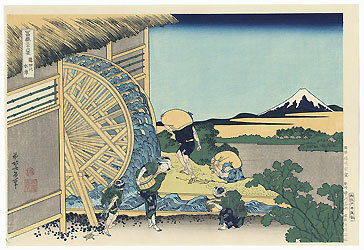 Hokusai and the Thirty-six Views of Mt.Fuji - In Japan, Mt. 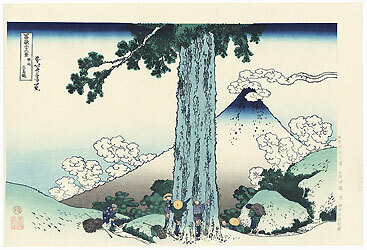 Fuji is a sacred place and a symbol of the country itself. 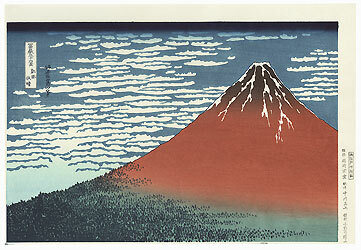 Rising majestically near the center of Japan, Fuji dominates the landscape and the Japanese national identity. 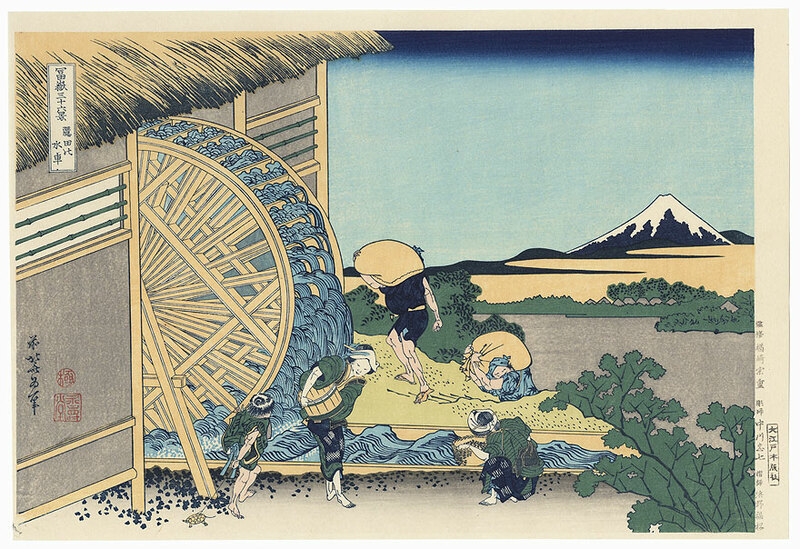 At the age of sixty-nine, the great Hokusai began what would become the most famous landscape print series of ukiyo-e, his incredible "Thirty-six Views of Mount Fuji." 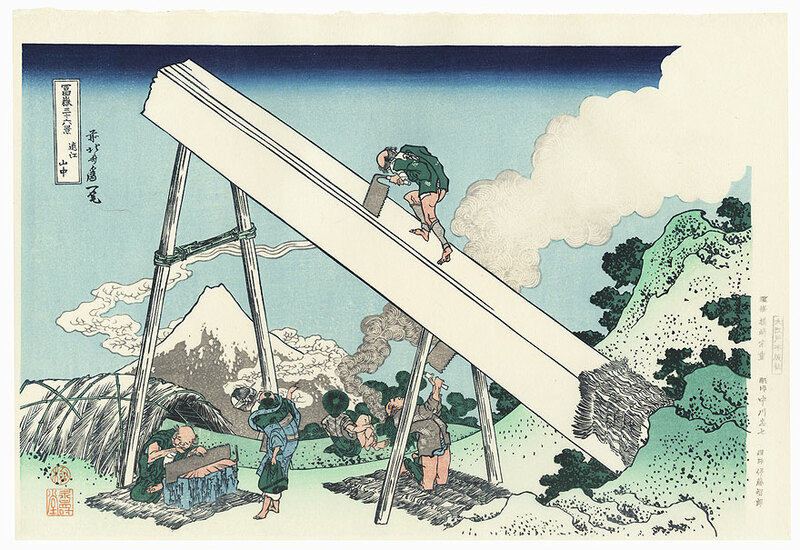 Originally intended to comprise 36 prints, the publisher added an additional 10 images, bringing the series total to 46 woodblocks. 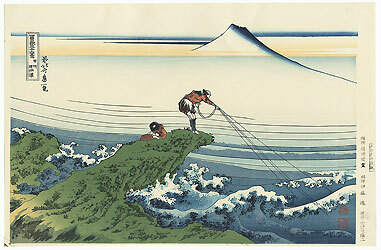 Originally published around 1830, Hokusai's bold compositions capture the strength, beauty, and symbolism of Mt. 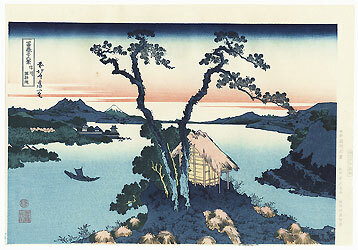 Fuji in rain and snow, at sunrise and dusk, and from a variety of vantage points. 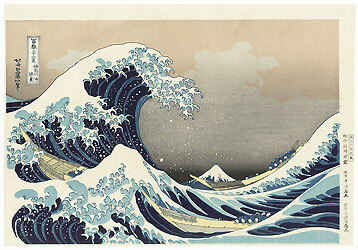 The series includes some of Hokusai's greatest masterpieces. These fantastic images portray the strength and majesty of nature, leading the viewer to contemplate man's place in relation to the natural world. A truly magnificent series, "Thirty-six Views of Mount Fuji" justly remains Hokusai's most famous and highly regarded work. Oedo Mokuhansha - These classic designs were produced by the well-known Tokyo publisher Oedo Mokuhansha amidst a resurgence of interest in ukiyo-e in the early 1950s. 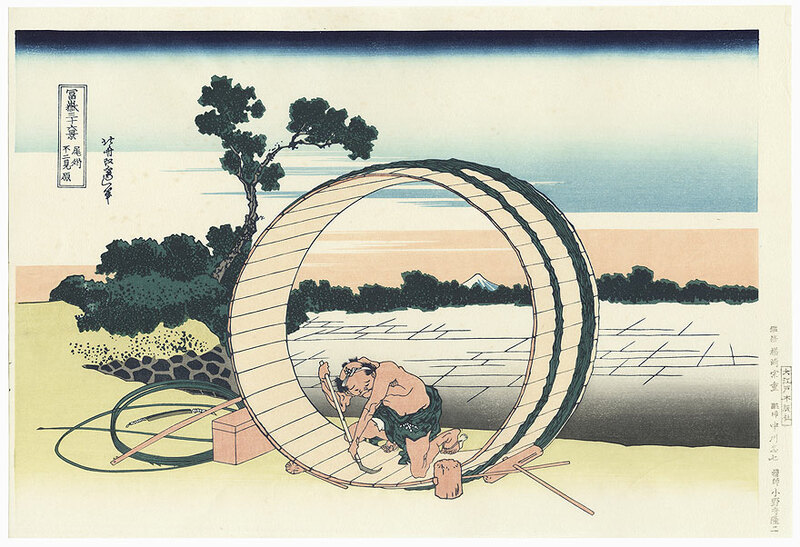 Like many of these traditional businesses, the woodblock print craft was passed down through generations, and the Oedo Mokuhansha company was formed by descendants of an Edo era publisher. These are nice prints of the highest quality standards and an excellent choice if you are looking for fine old woodblock reprints. Each print features the Oedo Mokuhansha publisher's seal in the margin. 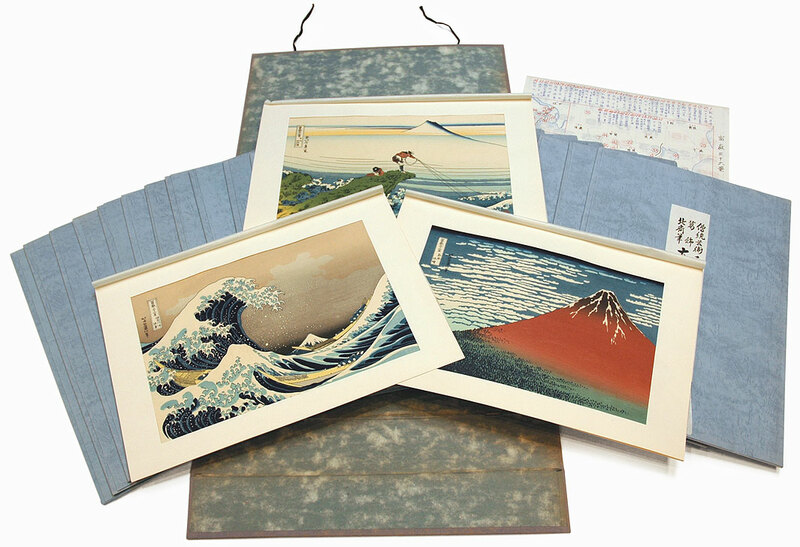 This Complete Boxed Set - This attractive, complete boxed set comprises all 46 prints from Hokusai's "Thirty-six Views of Fuji" series. 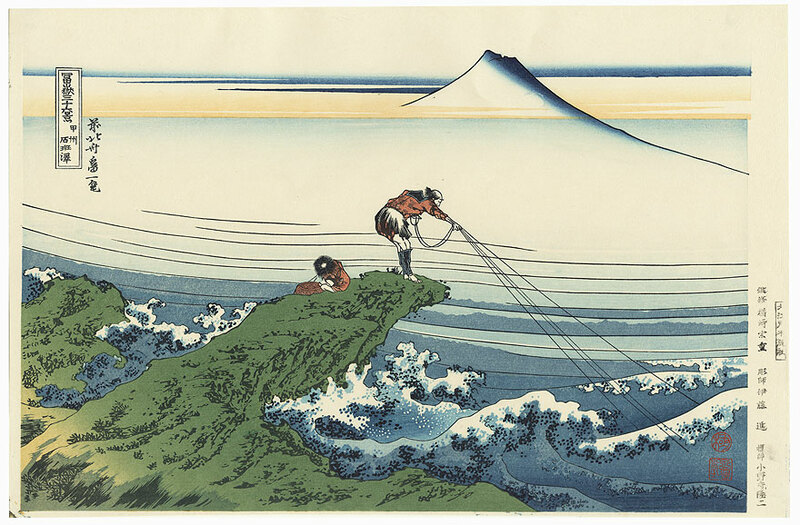 Hokusai's masterwork Fuji series includes his iconic "The Great Wave," along with memorable designs such as "Red Fuji" and "Thunderstorm beneath the Summit." The designs are nicely printed with fine detail and soft bokashi shading. 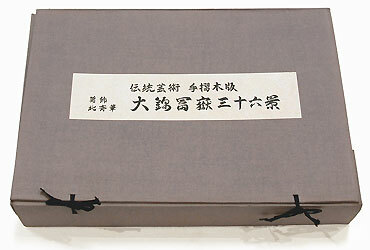 Each reprint come in an individual windowed viewing folder, with two folders slipped into each of the 23 separate blue outer folders with the series title. 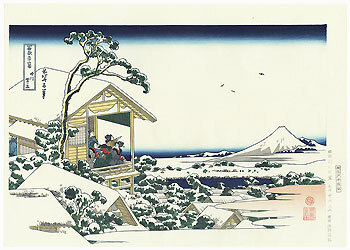 Some of the prints are loose within the viewing folder, but most are mounted on the reverse at top corners to the viewing folder. The outer folders fit into a traditional cloth-covered box with string ties. 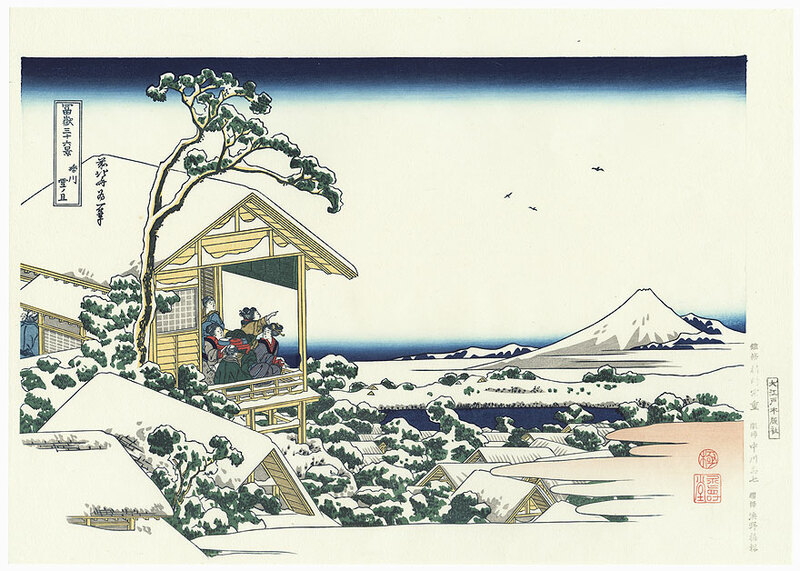 This is a terrific opportunity to collect a complete set of all 46 woodblock prints from Hokusai's "Thirty-six Views of Fuji" in a beautiful boxed set. 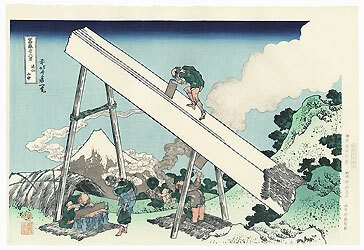 Please note: - This boxed set is quite heavy. 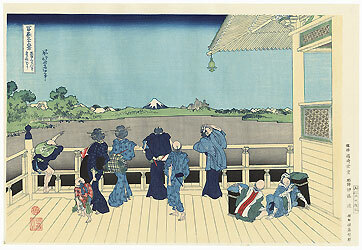 International bidders are welcome; however, there is an additional $75 charge to ship the set internationally. 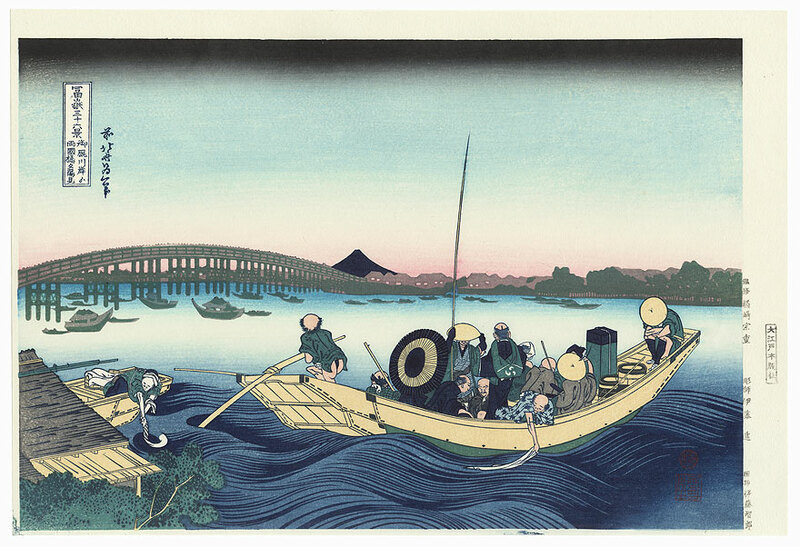 Size - Prints 9 3/4" x 14 3/8" + margins as shown; viewing folder 12 5/8" x 18 5/8"; overall size 14 1/2" x 19 1/2" x 3 1/2"
Condition - Prints with excellent color and detail as shown. 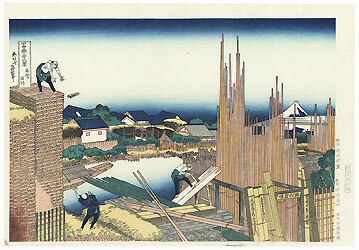 Five prints have a spot or two in subject. All other prints in excellent condition with no issues to report, including "The Great Wave," "Red Fuji," and "Thunderstorm beneath the Summit." One viewing folder has staining at edge. Please see photos for details.